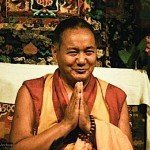 The much revered Guru Lama Yeshe. 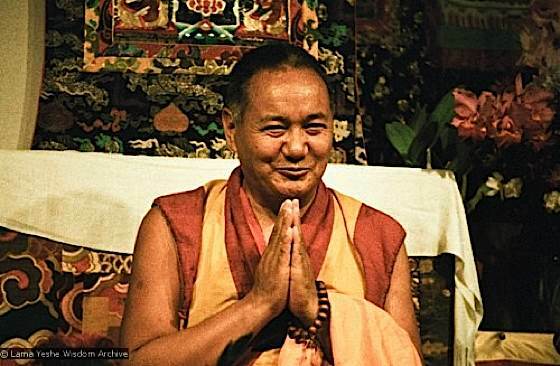 The great teacher Lama Yeshe once asked: “Why are there so many different deities in tantra?”  On one hand, Mahayana Buddhism speaks to universality, emptiness, oneness and the illusion of “I” or interdependent nature. 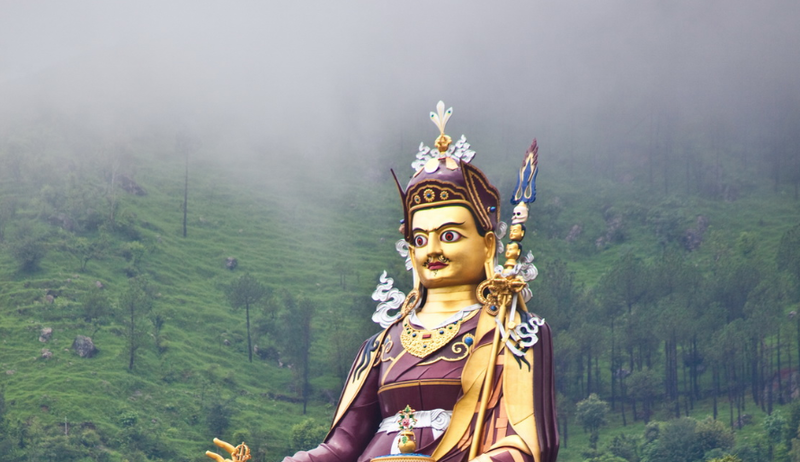 On the other, Vajrayana Buddhism — often referred to as the “lightning path” and holding out the hope of realizations in one lifetime — includes the practice of deity yoga. These numerous deities appear contrary to the doctrine of emptiness/oneness — particularly from a Western cultural perspective. 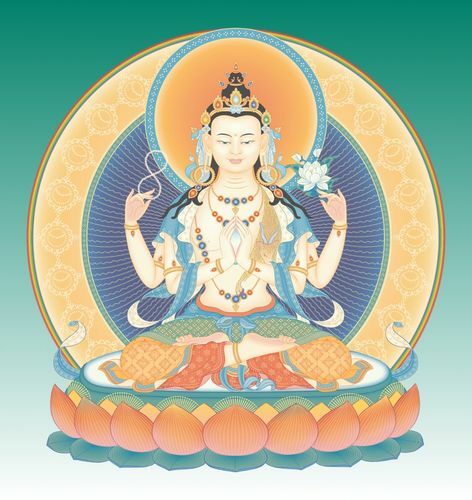 Although Vajrayana Buddhist practice begins on the universal Buddhist foundations of renunciation, refuge and contemplation, advanced practitioners are taught to visualize deities ­— and not just to imagine the deities, but to become them, merge with them or absorb them. Where foundation practices emphasize simplicity — notably, mindfulness meditation and contemplation of emptiness — Tantric Buddhism practices can seem overwhelming in the complexity of visualization and commitments. Probably the most popular meditation deity is Avalokitesvara, renowned around the word as the very embodiment of compassion. 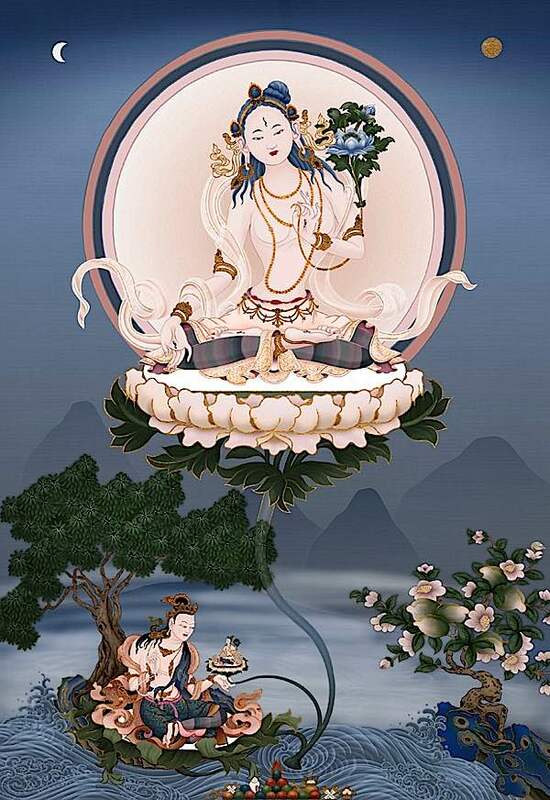 Lovely and peaceful Chenrezig practices are easy visualizations for most meditators. How does a modern Buddhist relate to this apparent contradiction? Western practitioners, in particular, can be quite put off by the apparent pantheon of deities. One of my Buddhist friends asked, “Don’t all these deity practices foster superstition?” Which led to a long, spirited discussion—Buddhist debate being an honoured tradition—on what deity practice and visualization are really all about. Later, as I tried to explain to her the elegant concept of creation and completion stages, she said, “Then why bother creating what you’re going to dissolve into emptiness? Why not just accept emptiness?” My lame answer was something like, “Because it’s one thing to intellectualize the concept, another to engage in it. Otherwise, emptiness is just another label.” Hardly, a satisfactory answer, but the best a novice practitioner could offer at that time. Stunning visualizations such as deities in yabyum—symbolic of the union of wisdom (female) and compassion (male) — were often misunderstood. The symbolism is profound and universal. Deity yoga visualization is growing in popularity in the West. 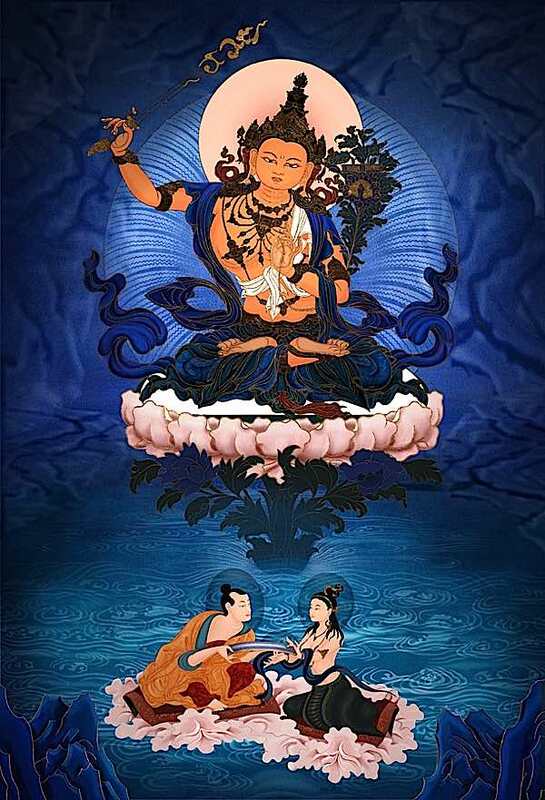 Depicted here is Heruka in an embrace with Vajrayogini. 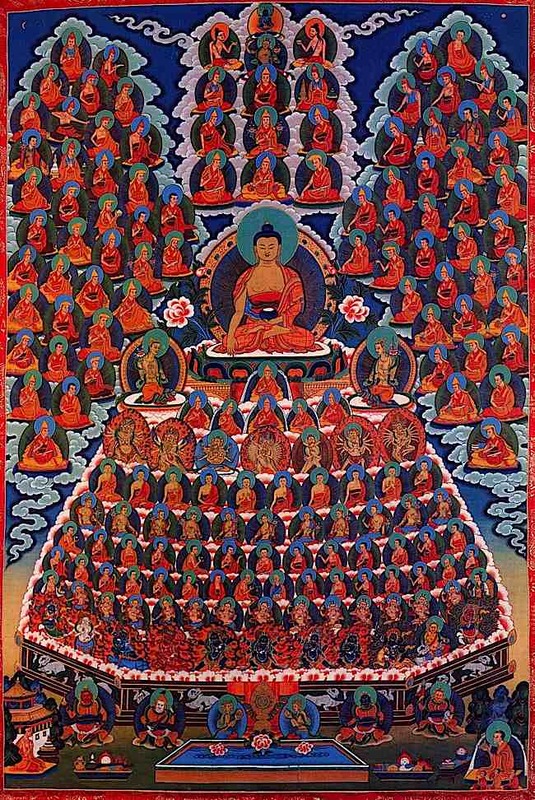 Unique to Vajrayana are advanced and highly detailed visualizations of the “Field of Merit.” The meditator tries to create and hold a vision of the lineage of buddhas, bodhisattvas, lamas, sages and mahasiddhis right back to Shakyamuni Buddha (here shown in the centre.) Then, mentally, we prostrate and make offering to the visualized gurus and deities. Such strenuous visualization trains and disciplines the mind, while also creating the conditions for positive merit. 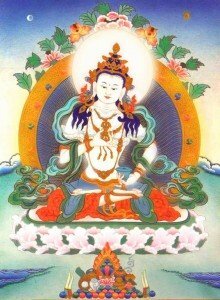 If the goal is to glimpse the “ultimate” and help use comprehend emptiness, why actually foster the practice of visualizing deities? 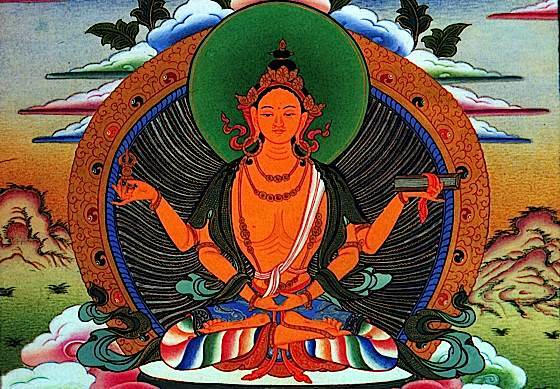 The very embodiment of emptiness — Prajnaparamita. Therefore, the question is, why is deity visualization rising in popularity in the modern, scientific age? One common answer, overly simplistic, is that the language of mind, and particularly subconscious, is a symbol. Deities are visualized (created) as symbols. In the language of Carl Jung, deity symbols are part of the “collective unconscious” of society. 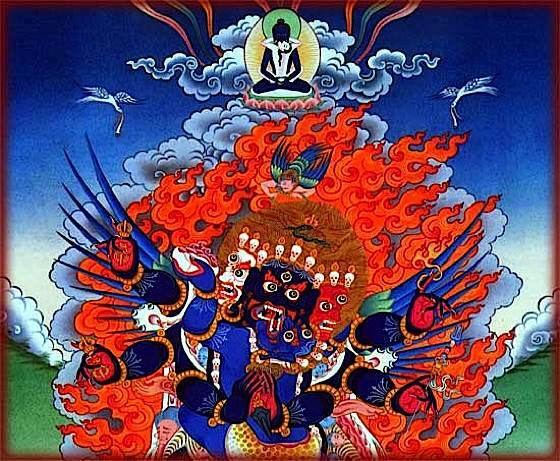 Vajrakilaya is the fierce aspect of Vajrasattva, and is treasured for very powerful karma purification practices. Here, Vajrakilaya is shown with consort. Deity yoga is not the only visualized method used to “stop ordinary perception.” Chod practice visualizes demons, spirits, and ghosts. “This is because all humans, each of us, must come to terms with the demons of fear, aggression, temptation, ignorance, and their cohorts if we are to live a free and sacred life, ” according to Jack Cornfield in his introduction to Tsultrim Allione’s Feeding Your Demons. Where Chod “makes friends with your demons”, deity yoga asks you to “become the deity.” Both practices engage and stimulate Mind. Vajrasattva is a foundation deity practice renowned for purification of body, speech and mind. 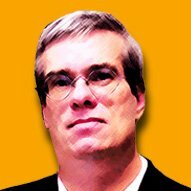 It is easy to jump to the conclusion that deity visualization is strictly in the realm of dreams or “only in the mind.” In fact, another underlying purpose of deity visualization is to come to understand that “these two separate worlds… internal and external were one continuous seamless whole”  and that even mind itself is empty of inherent existence. To help facilitate this understanding, a key goal of deity yoga is to cultivate bodhicitta, particularly “ultimate bodhicitta” that “perceives the emptiness (sunyata) of inherent existence of all phenomena.”  Emptiness is one of the most important teachings of Buddhism, and also one of the most difficult to understand. Deity visualization takes the practitioner beyond intellectualizing the concept of Emptiness. 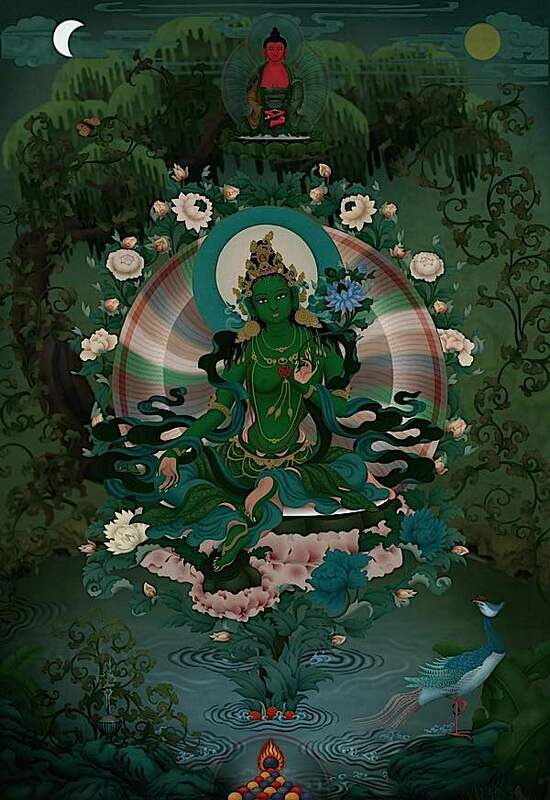 A stunning thangka of Lord Manjushri by Jampay Dorje. 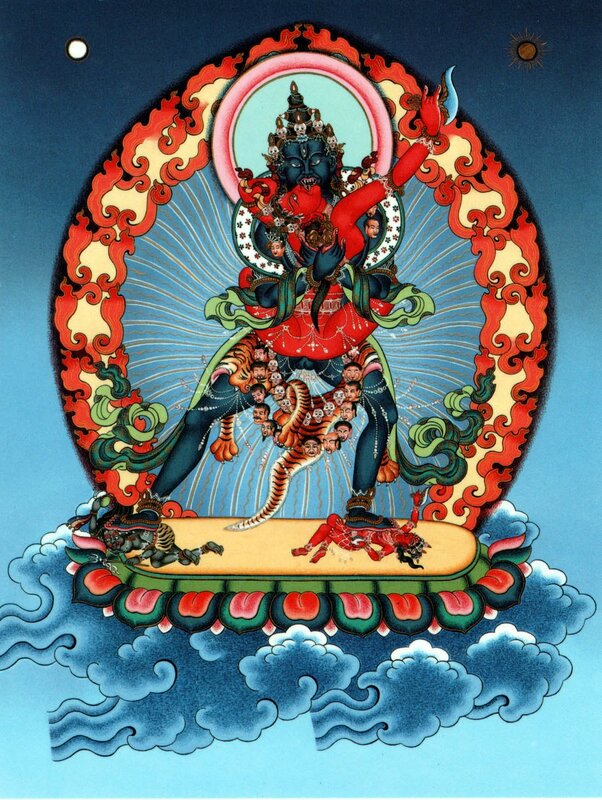 Vajrayogini practice is a highest yoga tantra practice, suitable for advanced practitioners. 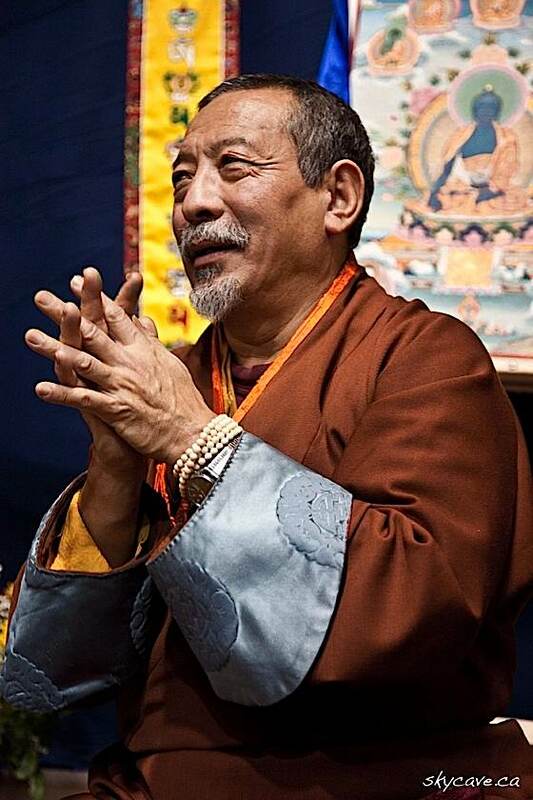 Venerable Zasep Tulku Rinpoche spiritual head of Gaden for the West and Gaden Choling Toronto. The healing, from a Buddhist perspective, has to do with engaging the mind in purifying negativities. Or, put another way, putting cutting suffering at the source. It is the mind that forms attachments. It is at the level of mind we cut attachments that trap us in the endless cycle of suffering. Is Deity Yoga Buddhist? The Philosophical Foundations of Tantric Practice, by Brian T. Hafer, Duke University Department of Religion, Latin Honors Thesis, April 30, 1997. Venerable Zasep Tulku Rinpoche speaking during a 10 day Tara retreat in Nelson, B.C.